Hypertrophic cardiomyopathy (HCM) has fascinated (and scared) cardiologists for years owing, in part, to the relatively few cases most physicians will see in their practice, coupled with increased risk for sudden death, complex yet incomplete genetic understanding, and enigmatic hemodynamics. The management of symptomatic patients with HCM evolved over the past (nearly) 6 decades owing to focused efforts to understand the pathophysiology and perfect the necessary skills to delivery exemplary outcomes.1 We have learned that it is entirely possible for patients with HCM to have excellent quality of life and normal lifespans, that most patients can be treated with pharmacologic therapy, and that for most patients who remain symptomatic, there are procedures that can deliver excellent benefit with low risk. The article by Kim et al2 using a national discharge database sampling method examines observed event rates among patients undergoing surgical septal myectomy or percutaneous septal ablation. Some of the findings are not surprising: there is a clear association between procedural volume and complications and there are differences in baseline characteristics between patients undergoing the 2 procedures. There are some shocking results: the median number of myectomy cases or ablation cases in this database is less than or equal to 1 case per year. Seriously, only 1 case per year? Why would we subject our patients to this? There is some critical information missing as an artifact of the study design: specifically, there are no effectiveness data and thus, a comparison cannot be made between the results of surgical septal myectomy vs septal ablation. More importantly, there is no description of what can be expected if the procedures were performed not just at higher volume centers, but at Centers of Excellence. The study of Kim et al2 in this issue of JAMA Cardiology does go a long way to making an excellent case for having a few highly focused centers that specialize in the care of patients with HCM. The results achievable at major HCM centers are remarkable. In expert hands, surgical myectomy has a greater than 95% efficacy, with mortality rates that are approaching 0% (ie, thousands of cases performed without an operative death), normalization of long-term survival following the procedure, and a reduction in sudden cardiac death.3-5 Similarly, among those patients who respond to septal ablation, the symptomatic improvement can mirror that of myectomy, with a procedural mortality rate that is only about 1%.6 Given that there are recognizable differences in complication rates and controversy regarding the association between septal ablation and subsequent sudden cardiac death/implantable cardioverter defibrillator discharge rates, the American College of Cardiology Foundation/American Heart Association guidelines, as stated in the current article, recommend surgical myectomy as the preferred strategy for most patients with HCM with drug-refractory symptoms and that ablation is a reasonable alternative in select cases.7 The guidelines emphasize that both procedures be performed by experienced centers and recommend a shared decision-making process, in which the fully informed patient is able to choose the procedure based on their own needs and preferences. Looking specifically at the data in the current report,2 regardless of the procedure type, there is an approximate 4-fold increase in mortality comparing the high-volume tertile to the low-volume tertile. 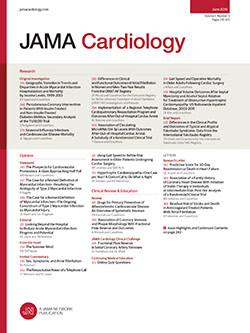 Notably, the best mortality rates for myectomy as reported in this article, from their high-volume tertile, are still nearly 10-fold higher than what is seen at HCM centers.8 That even higher-volume centers appear to have a mortality rate that is 10 times greater than what is observed at centers with focused expertise in HCM is an important observation that is worth serious discussion. Indeed, this may underestimate the magnitude of the differences. Based on the data presented, the low-volume centers would expect a procedure-related death for every 6 attempts, while the highest tertile reported here would expect a death for every 26 attempts. Yet, we know from previously published data that HCM centers can go 1500 or more cases without a procedure-related death.8 Six vs 26 is incremental improvement; 26 vs 1500 is improvement measured in magnitudes of order. There should be no debate. For years, the cardiology community has recommended and accepted that adults with congenital heart disease should receive their care from regional specialized centers for adults with congenital heart disease.9 Recently, given the wide variability in outcomes following operations for mitral valve disease, a disease and set of procedures that are far more prevalent than HCM, there has been a thoughtful call for these procedures to be restricted to those centers that can demonstrate excellence in benefit and safety.10 Hypertrophic cardiomyopathy has a complexity and prevalence that more closely mimics that of adults with congenital heart disease, but HCM also has important abnormalities of mitral valve function. It is in the best interest of the patients then that they be informed they can expect to have a procedure with a vanishing mortality rate and 95% chance of significant, durable symptomatic benefit. No patient should have a complex procedure done where the volume is 1 per year. The data in this current report,2 coupled with the well-established data from HCM Centers of Excellence, make a clear case that for HCM, not every hospital or operator should be performing these procedures. The low-volume safety data are unacceptable. The middle volume data are not good enough. Even the highest-volume tertile safety data are dramatically inferior to that achieved at HCM Centers of Excellence. In the end, it is not a matter of logistics, convenience, or referral patterns; it is the right thing to make sure patients get the opportunity to experience the safety and effectiveness that true expertise provides. Let’s heed this clarion call to help our patients. Corresponding Author: Steve R. Ommen, MD, Mayo Clinic, 200 First St SW, Rochester, MN 55905 (ommen.steve@mayo.edu). Published Online: April 27, 2016. doi:10.1001/jamacardio.2016.0277.